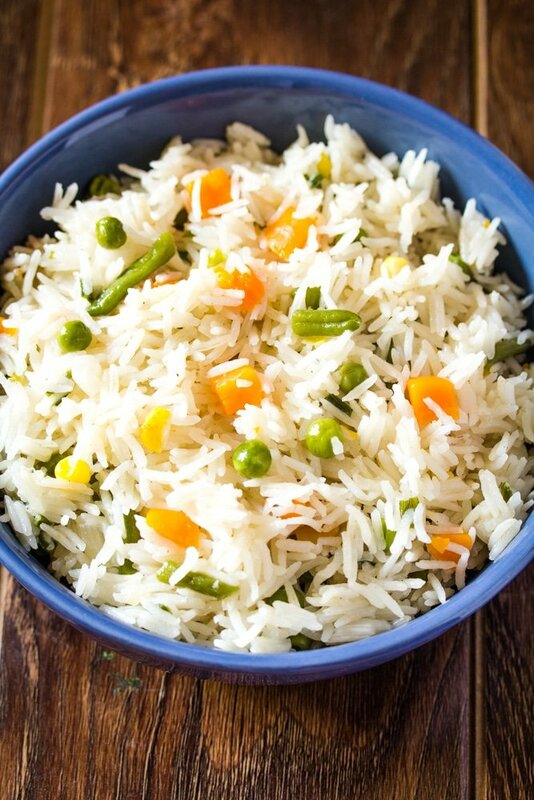 Veggie Rice or Vegetable Rice is an easy and quick rice recipe, that’s perfect as a meal on its own or as a side dish. It’s also a very versatile recipe where you can add any vegetable of your choice! It goes well with delicious chicken recipes such as this Chicken Karahi or Gobi Manchurian. Ever since I’ve had my second baby, cooking has become pretty difficult. Especially since he likes to hang onto my legs for dear life as I try to cook. And there’s only so many times you can take out, without feeling guilty. So I’m always on the look out for super fast (but also super delicious) recipes…and this Veggie Rice recipe is just checks all the boxes. 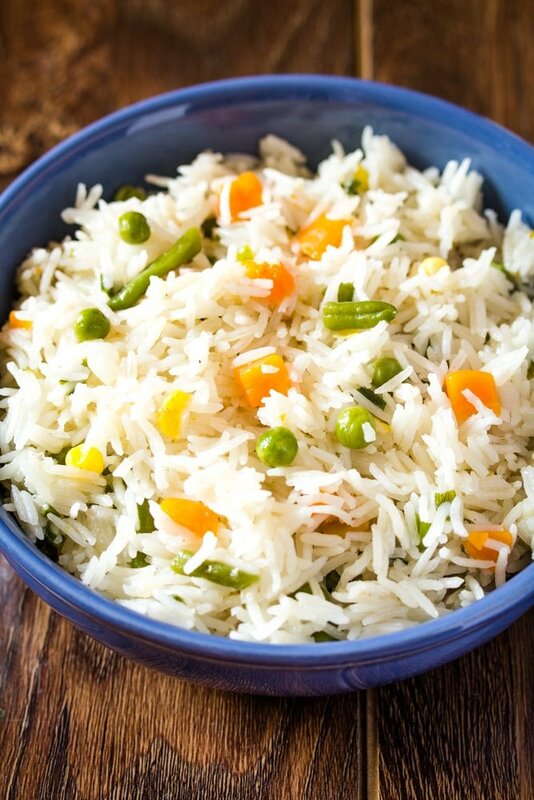 Let me break it down for you…this is probably the easiest veggie rice recipe you’ll ever make…and you won’t look back! 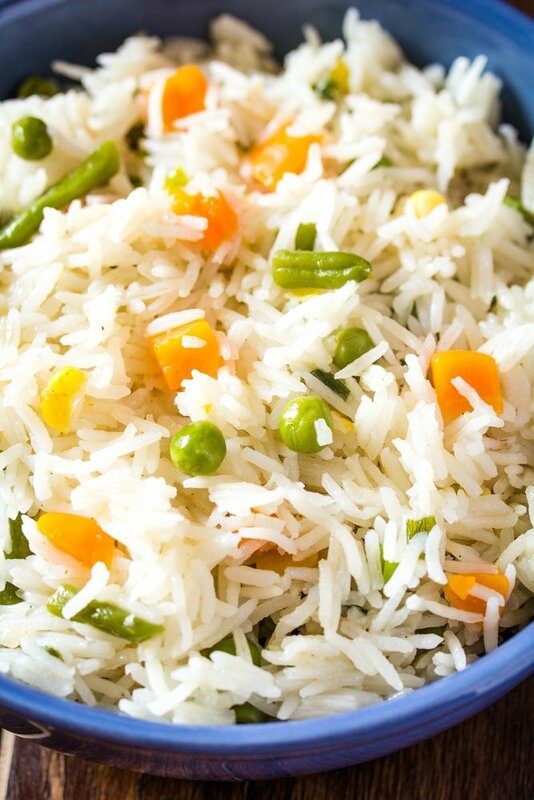 Why is this Veggie Rice Recipe so Easy? I use mixed frozen veggies for this veggie rice. Because A.) I don’t like chopping a million veggies and B.) I totally buy into the flash frozen vegetables are fresher fact. Also, I use basmati rice for this recipe, but I don’t soak the rice. It cuts down on the waiting time, and also I feel like the rice is less likely to break down. Another great thing about this recipe is that everything is cooked in one pot, and you don’t have to use a day old rice like you do for fried rice recipes. Also, you can basically do whatever you want with this recipe…there aren’t any strict rules! Want to use fresh vegetables? Definitely do! Want to add some chicken, why not?! Want to add egg? Woohoo, go for it! So How Do You Make Vegetable Rice? Start by chopping a small onion, and then saute it in a little bit of oil until it’s just softened and translucent (but not golden). Add the veggies and saute for 5 minutes on high heat. Add salt, pepper and some chopped green onion. Saute for 2-3 to minutes. Add two cups of water and bring to a boil. Add 1 cup of rice, and cook on medium heat until most of the water has evaporated and the rice is almost cooked through. Cover the pot with a lid, and lower the heat to the lowest setting and let the rice steam for about 5 minutes until it is fully cooked through. Remove the led, fluff the rice and serve immediately. 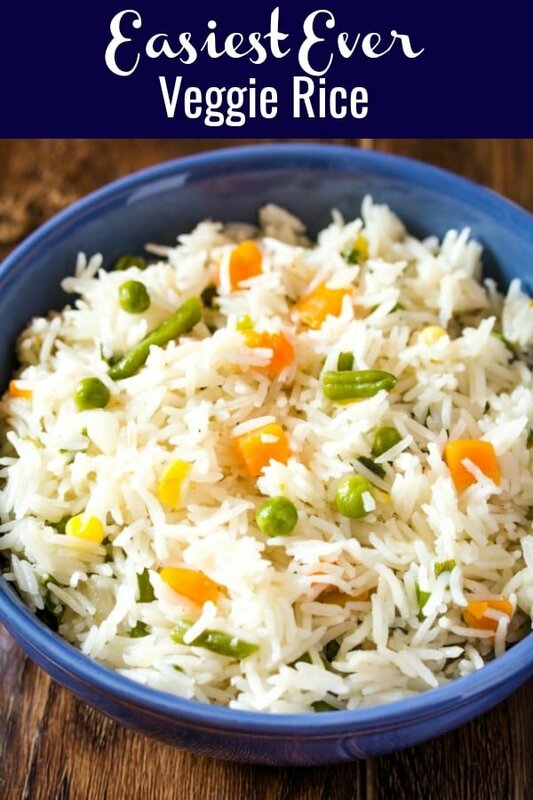 So if you’re like me and short on time for cooking, but still want home cooked food…do try this veggie rice recipe…it’s a lifesaver. Seriously!!! What to Serve with Veggie Rice? 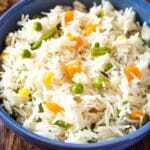 Jeera Rice – Only 3 Ingredients! 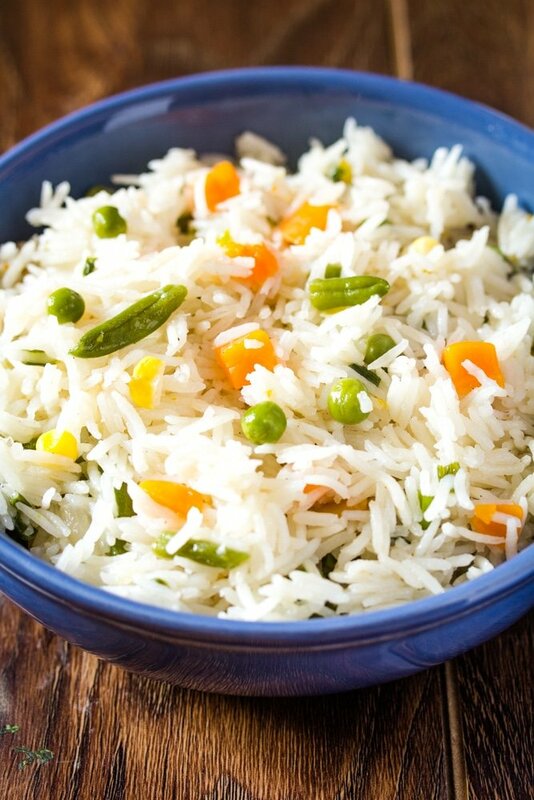 Veggie Rice or Vegetable Rice is an easy and quick rice recipe, that’s perfect as a meal on its own or as a side dish. It’s also a very versatile recipe where you can add any vegetable of your choice! In a pot, heat the oil, and fry the onion until just translucent. Add the water, and cover the pot with a lid. Bring the water to a boil, and then add the rice. Cook on medium high heat until most of the water has evaporated and the rice is almost cooked. Lower the heat to the lowest setting and cover the rice. Let the rice steam for 5 minutes or so, until it’s completely cooked. Remove from heat and fluff the rice with a fork.